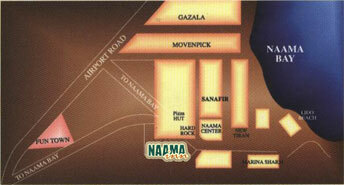 The NAAMA INN Sharm El Sheikh hotel is superbly located on the vibrating heart of NAAMA BAY area. With easy access to St. Catherine Monastery, Nuweiba Fortress, Colored Canyon, Dahab, the Pharaoh Island and many prime diving sites. The hotel is beautifully landscaped with tropical trees, and natural rocky background in addition to magnificently designed swimming pool. 20 minutes drive from Sharm El Sheikh International Airport. 5 minutes drive from Sharm El Sheikh Bus Station. 7 of them are spacious rooms with balconies, 21 with terraces overlooking the charming pool area and 10 with large terraces that enjoy an exceptional view of NAAMA Bay's busy walkways, food court and shopping area. - Le Balcony: Terrace Café. - Entry requirements: For Visa, it is recommended to inquire at the Egyptian representative’s office in your country. - Language: Arabic is the official language (English and French are widely spoken). - Currency: Local currency: Egyptian Pound (L.E.) Reference currency: US Dollar (USD) and Euro. - Credit Cards: Visa International, American Express, MasterCard. - Electricity: 220 volts 50/60 Hertz. - Health: Please check with your health department. Winter average temperature is +26o C.